Adapted from Marisa McClellan’s The Food in Jars Kitchen, this chutney recipe will work with apples, apricots, cherries, nectarines, peaches, pears or plums. This is a half recipe, so scale up as needed. Combine all the ingredients in a large, nonreactive pot. Bring to a boil over high heat and then turn heat to low and cover the pot. Cook for 20 minutes. Uncover and raise the heat to medium, adjusting the heat as necessary to allow the mixture to stay at a constant simmer. Simmer, stirring often, for 20-40 minutes more or until the chutney thickens, darkens and the flavors start to marry. I liked to purée the chutney in my food processor to a coarse thickness — I have weird textural issues with cooked raisins and puréeing the chutney solves the issue for me … no need to do this if you have no trouble with cooked raisins. 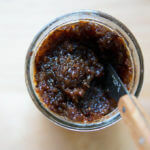 Transfer chutney to a jar and store in fridge for one to two weeks. Alternatively, process the chutney: prepare a boiling water bath, and sterilize three half-pint jars. Spoon the chutney into the prepared jars, leaving 1/2 inch (1.5 cm) of headspace. Wipe the rims, apply the lids and rings, and process in a boiling water bath for 15 minutes. When the time is up, remove the jars and set them on a folded kitchen towel to cool. When the jars have cooled enough that you can comfortably handle them, check the seals. Sealed jars can be stored at room temperature for for up to 1 year. Any unsealed jars should be refrigerated and used promptly.